Disclaimer: This Entangled Teen Crush book contains one epic party, complete with every high-schoolers-gone-bad shenanigan, and two opposites with nothing in common and nothing to lose...except their hearts. 5.0 out of 5 starsI NEED MORE! GAH! What can I even say at this point?! It’s the end of the Grad Night Series and I don’t even know what to do with myself anymore! Lennon and Jade’s story was truly the perfect ending. But it was more than that because it was simply the ending I didn’t want to happen! I fell extremely in love with this series and couple as a whole! SO much nostalgia of that feeling you get when you fall in love for the first time. It’s the looks and the blushing, the butterflies and the nervous giggles, as much as it is a bit terrifying when you’re forced to think about your future right after high school and how that love could possibly thrive after graduation. Seriously, this series, this book, is one everyone needs to read. There’s nothing wrong with a little YA loving in your life every now and then and Molly Lee did nothing but execute it perfectly. I can only hope for more on how the rock star and the mathlete continue to be exactly what they were missing from each other lives! This goes for all the characters in this series! You’ll fall so in love with their individual stories you can’t help but want more. Anyone else smell a NA novella coming??? Awe Lennon and Jade. They made my heart full. I love the banter between them. 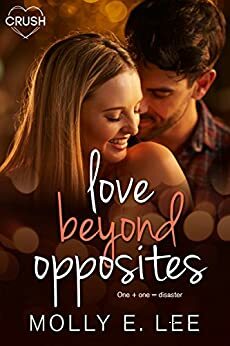 At first glance one would think a rock star and a mathlete are complete opposites but once you dive in past the surface and get to know Lennon and Jade you can see they are a perfect match. You understand the fears of Lennon wanting to start relationship just as they all graduated. But once the Grad night commences and the mayhem that follows Jade and Lennon's night you just hope he finally just jumps. After 4 years of fighting his feeling for Jade I love how it all goes down. I love how you get a little bit of Fynn and Bray in this one too. These friends are amazingly supportive of each other. I laughed out loud with this one and got the awe feeling along the way. This series has been amazing. I don't know if I'm ready for them to all go just yet. But in the end you know that Jade and Lennon, Fynn and Bray and Zoey and Gordon are all perfect for each other. Molly E. Lee did an amazing job with this series of making you feel like you were apart of each and every Grad night adventure. I love this YA series. What happens when the mathlete falls for the rock star... or the rock star falls for the mathlete??? That EPIC Grad party had so much more in-store for Lennon and Jade than they ever imagined. Did you spend 4 years crushing hard over a guy/girl. Well these 2 did. It wasn't until that epic grad party Lennon threw that he really understood his feelings for the mathlete that he had small chats with durring her practice. When Lennons laptop took a swim in the pond, he needed a ride to his dad's to get his other one... it was Jade to the rescue. They spent quite a bit of the night together and realized they were ment to be. Another amazing book by Molly E Lee. 4.0 out of 5 starsLoved it! Reading this series has been another journey. Molly knows how to get her readers hooked to her books. I felt like I just started reading and five minutes later I turn into the last page. This is not Molly's best work (in my opinion) but I still enjoyed reading Jade & Lennon's story. This trope is one of my favorites! 4.0 out of 5 starsOh the angst! Oh the teenage angst!! It was so strong in this one! The whole way through you can’t help but wish for these two to get it together. So much time wasted! Ugh! Jade and Lennon were destined to be. They were quirky and fun, sweet and lovely. I thoroughly enjoyed this well-written book!